The flood of 1964 removed most vegetation along the river bank creating a sandy beach. Vegetation quickly began to grow back as can be seen in the background. July 8, 1965, Illinois Valley News, Cave Junction, Oregon. The Illinois River Forks State Park is situated at the junction of the east and west forks of the river that both run through the region that was part of 1851 Oregon gold rush. The river got its name in the early years of the gold rush in reference to some of the first prospectors to come here who were reportedly from Illinois. The west fork has its origins the Kalmiopsis Wilderness and the largest outcrop of mantle rock on the west coast. The east fork has its origins in the Siskiyou Wilderness, Red Buttes Wilderness, and Oregon Caves National Monument. The Illinois River is one of the last major salmon spawning rivers in the Pacific Northwest with no large obstructions to salmon migration. Prior to the completion of the Redwood Highway in 1926, it is unlikely that this part of the river was a recreation destination of any significance. The stage road from Grants Pass to Crescent City, a route that had been in use since 1856, crossed the east fork about a half mile above the confluence (32). Archaeological artifacts have not been found in the park (28) so it may not have had a significant importance to Native American’s although it is possible that artifacts associated with Native American camps or villages located near the river could have been washed away by major flooding events such as those that happened in 1852, 1927, 1955, 1964, 1974 and no doubt many other times. 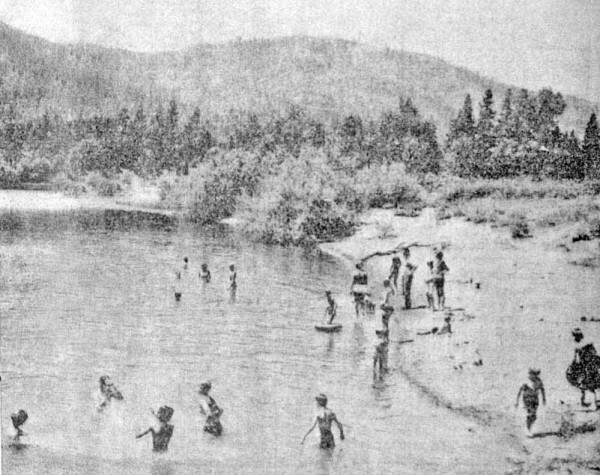 The “forks” swim hole probably started being used on a regular basis for recreation when the city of Cave Junction was established in the mid 1920s after the Redwood Highway and Oregon Caves Highway were constructed. However, there were no records in the early history of this community that indicated the swimming hole was being used and the first mention of it is found in the community’s newspaper, the Illinois Valley News, which opened in 1937. Maps from the 1930s and 1950s (30) show a road that intersects with the Redwood Highway and crosses the west fork of the river and continued to connect to Westside Road. A portion of this road can be found on a small hill about 800 feet southeast of the current day use area. A red arrow points toward the point where the east and west forks of the Illinois River meet. Cave Junction, Oregon. The earliest recollection of swimming at the “forks” comes from residents who grew up here and recall going there as high school students to swim in the 1940s (29). This was apparently a popular hangout for teenagers but wasn’t the only place in the vicinity of Cave Junction to swim. For several years, the owner of the Del Rio Auto Camp (formerly called the Cave City Park*) created a dam in the east fork by piling up gravel with a custom “dredge” he had rigged on an old Chevrolet truck (1). The dam was about 500 feet below the east fork bridge and the “lake” that formed was estimated to be about a fourth of a mile long, which would have extended under the bridge and up stream. The had row boats that camp guests and local residents could use to float on the lake (1). The Del Rio Auto Camp was located next to the east fork bridge immediately south of Cave Junction so there was little need to go to the swim hole at the “forks”. It is uncertain when the owner of the Del Rio Auto Camp stopped building these dams but it likely stopped after a swimming pool was constructed at the auto camp sometime in the early 1950s. 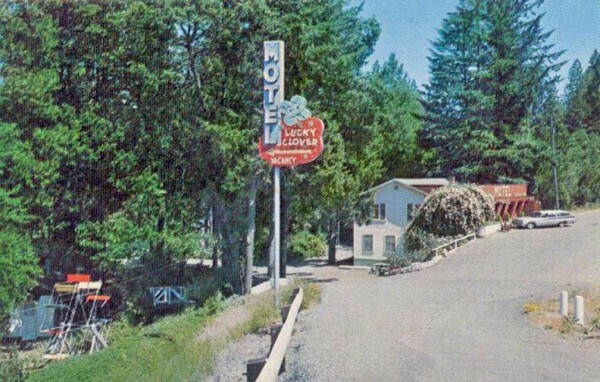 By this time, the Del Rio had been renamed the “Lucky Clover Motel”. A few years after Cave Junction was established in the mid 1920s, the City of Cave Junction started using the “forks” area as a city dump through an agreement with the Bureau of Land Management. It is uncertain when this dump started but it was closed when the permit expired in 1959. The permit was not renewed because the BLM had decided this area would be better used for recreational purposes. It is uncertain what happened to the trash at the dump site. The area was used as a source of gravel when the east fork bridge was reconstructed in 1956 and may have been used when Redwood Highway was surfaced with gravel from 1929 to 1931 (33). In 1957, a rock crusher operated in the forks area and seven trucks hauled the gravel away to be put in storage sites for the Oregon Department of Transportation (ODOT) and for use by Josephine County on Rockydale Road and other locations. Rock was also to be used on the approaches to the new east fork bridge. The excavation of rock and gravel may have created a pit, which could have been what the city was using as a dump site. If so, the trash in the dump was likely covered when the dump closed. In 1955, work began on building a new bridge over the east fork but completion was delayed by a flood in December of 1955 and the collapse of the new bridge in 1956. 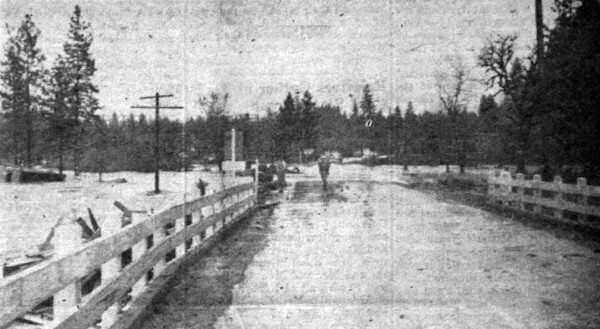 When the new bridge was completed, the old bridge was moved to Finch Road and the segment of the old Redwood Highway leading up to the bridge became the entrance road to the forks swimming hole. About the same time that the bridge was being reconstructed, there was increased publicity about swimming lessons being offered by the City of Cave Junction recreation program and the “forks” was mentioned as one of the places where swimming was taught (5). The swim program started in 1955 (18) when Wes Peters became the recreation program director (2). In the first years of the swim program the primary place for swimming lessons was at the Lucky Clover Motel pool on the north shore of the east fork and adjacent to the bridge but the “forks” was also used. A diving board was set up at the “forks” swimming hole in 1957 and there were efforts to do cleanup along the beach as part of providing recreation for the community (11). Lucky Clover Motel was located next to the East Fork of the Illinois River immediately south of Cave Junction. This photo was taken from the old bridge looking north toward Cave Junction. Date uncertain. After the second year of the swim program residents started calling the forks swimming hole the “swimming pool” as became evident in a 1957 article that said the Recreation Board had hired a bulldozer “to smooth out the road from the highway to the swimming pool”. 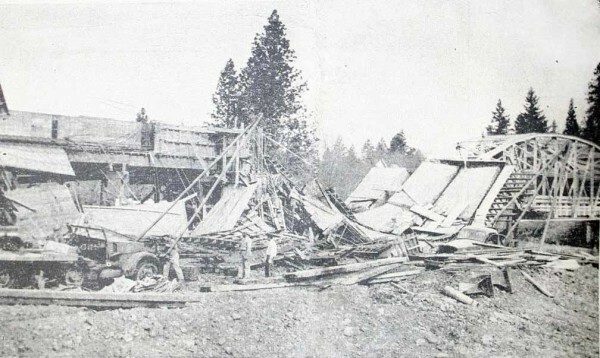 The article went on to say that in addition to the work on the road by the bulldozer “the parking area at the Forks has been enlarged for the summer season’s activities” and the city council had agreed to furnish a grader to work on the road “between the Redwood Highway and the swimming pool”. 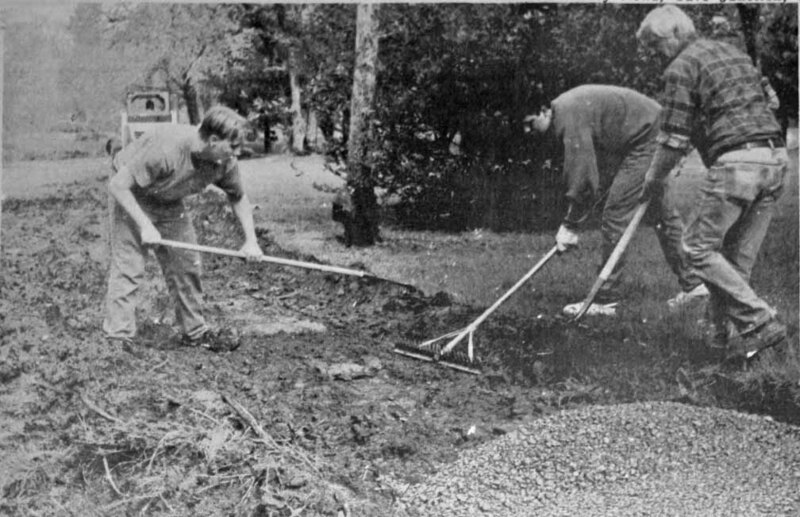 They noted that this work was outside the city limits but was being done “as a contribution of the city to the summer recreation program” (11). The popular sentiment among local residents that the forks swimming hole was the city’s “swimming pool” apparently resulted in confusion in swim lesson and life saving class schedules. The 1957 recreation schedule tried to clarify this by saying; “The morning swimming program will be at the Rauber pool at the Cave Park Motel [Lucky Clover Motel]. This is not to be confused with the swimming “hole” at the Forks, where the two branches of the Illinois River join” (11). In 1962, the entire swim program was moved to the “forks” because the swim program had “outgrown” the pool (18). They noted that about 25 children had participated in the program when it started in 1955 and in 1961 the class size had grown to 130 children. The 1962 swimming schedule at “the Forks” included swimming lessons for beginning, intermediate, and advanced swimmers as well as a swim period for mothers and infants and another time period for adults. On Wednesdays a playday [sic] was scheduled and participants were encouraged to bring water play equipment to include air mattresses, fins, balls, inner tubes, but no snorkels. The recreation director for the 1962 season was Mike Hanby, a qualified Red Cross Life Guard who was on hand to look after the swimmers (18). The first steps to create the Illinois River Forks State Park began in 1960 with the establishment of a 160 acre park for the purpose to serve tourists and local recreational needs to include camping, picnicking, swimming, and fishing. The overnight camping area was to be developed near the east fork of the river and there were plans to install a water system, water fountain, parking for 30 vehicles, build park trails, and a shelter for community events, which would include electrical outlets for electrical cooking (15). The park was established here because of the increasing need for such services. At that time the Collier tunnel immediately south of the Oregon-California border had been completed and tourist promotion efforts were stepped up by the Redwood Empire Association as well as by proponents of the Winnemucca-to-the-sea route. It was noted that vehicle traffic passing the entrance to the park was 2,600 vehicles in 1959 and by 1960 the number had doubled to 6,600 vehicles. They estimated that about 30,000 persons a year would use the facility. It was noted that this would be the only type of facility conveniently available for the public traveler on the Redwood Highway in this part of the state (15). 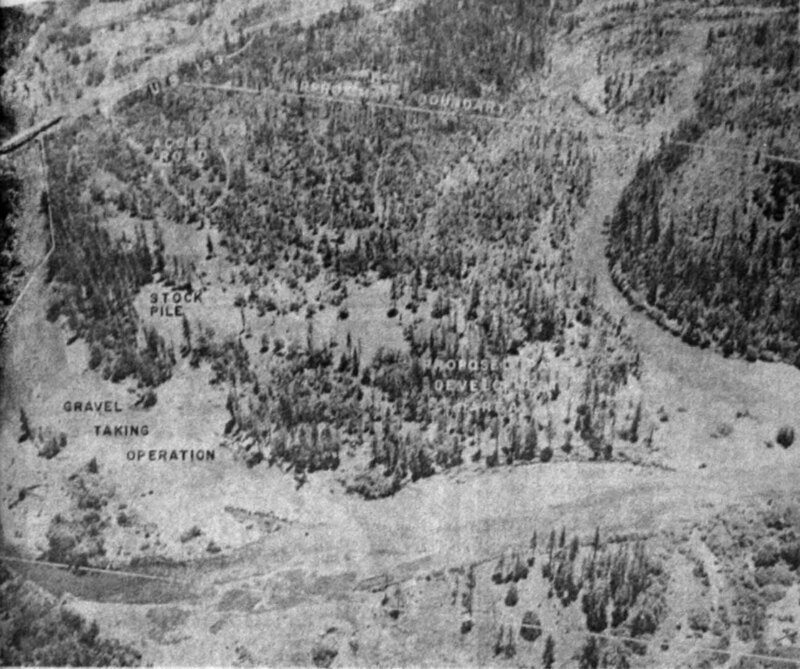 The area selected for the park was a square shaped area about a half mile in size with the north half being administrated by the Bureau of Land Management (BLM) and the southern half created by the purchase of three private properties owned by Carl Frerichs (Grants Pass), Irene Jordan (Gardenia), and John Kihs (Cave Junction). It was noted that the principal use of the land at that time was for gravel production for the Oregon Department of Transportation (15). A lease agreement was signed between Oregon Parks and Recreation Department and the BLM to allow the state parks to manage the 80 acre parcel for the purpose of recreation. This was signed in 1962 with the BLM charging the state 25 cents and acre (17, 27). The park was almost immediately promoted as part of the state park system and was included in the Oregon state map that was published in 1962. The state map identified it as the Illinois River State Park (19). Two years after the establishment of the state park, the region was hit by a major flooding event in 1964. It was uncertain what the damage to facilities may have been at that time but it may not have been much because development appeared to have been minimal. The original road and parking area developed in the early 1960s were oiled and it is uncertain when they were paved. A 1965 article published in the Illinois Valley News gives some clues that development was minimal. This article was printed in July of that year and said vandals had “turned over toilets, scattered trash, battered trash cans, and had unbolted the cable used to close the park” (21). The Chamber offered a $100 reward (equivalent to about $750 in 2013 dollar values) to identify and convict the vandals. The article indicated that the State Park Director had threatened to close the park because of the vandalism (21). The importance of the Illinois River Forks State Park to the local economy was recognized by the local Chamber and other community improvement organization such as the Illinois Valley Grange. 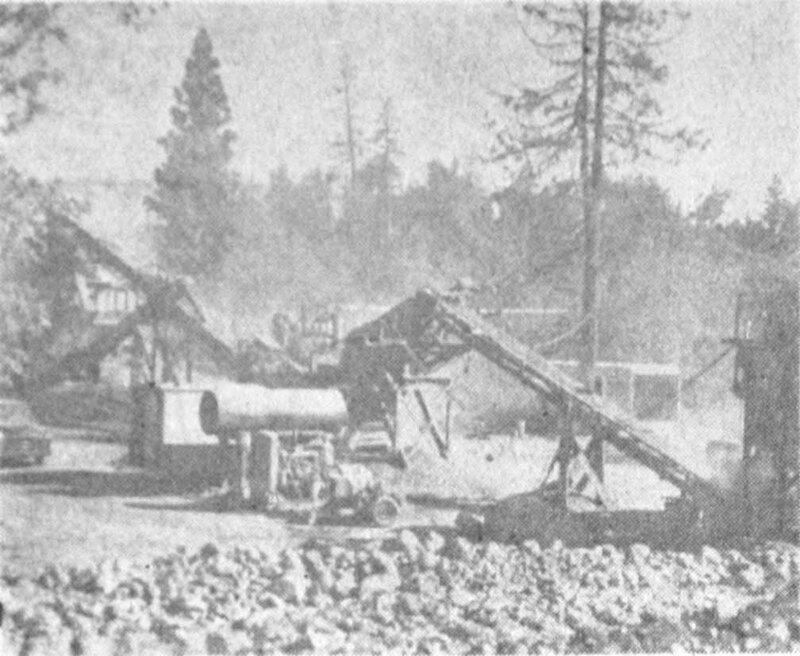 A 1967 article in Illinois Valley News indicated a feeling that the state was funding development of other state park properties, such as Valley of the Rogue State Park, and ignoring development at Illinois River Forks State Park. It was pointed out that the Forks was conveniently located to shopping in Cave Junction and it was “only reasonable to insist that the area be developed first” (23). The article went on to point out that the state identified the Forks Park as being “flood-prone,” and “although the  flood damage to Valley of the Rogue Park was much greater, has rebuilt and added even more units to the area.” It was noted that the Forks suffered flood damage in 1964 in the lower section, “but with so much high ground available, both the Grange and the Chamber cannot understand why improvements have not proceeded as they were led to believe were scheduled” (23). Other than contributions by local community residents and nonprofits, the development at the park by the State of Oregon appears to be primarily restricted to what was done in the 1960s when the park was first established. In 1976, Margaret McGee donated 190 acres for uses as state park land. This brought the park to its present size of 368 acres (27). This land comprises what is now the western side of the park where eight miles of equestrian loop trails were recently constructed. This part of the park is accessed by Westside Road. A local youth group, Fishwatch, organized and installed a wheelchair accessible loop trail in 1995. Most of the materials for the project were donated and community members assisted with tractors and other equipment 925). Students at Illinois Valley High School developed a trail guide for loop that continues to be available at the park today. The Illinois River Forks State Park Master Plan was developed in 1996 (28). Several development targets were identified to include a 60 site camping area for overnight campers and travelers in recreational vehicles. A local community group organized the first River Festival in 1998 (26). There were many partners from local government agencies and nonprofits who provided educational activities for children, artists set up booths, and performances by local bands and choral groups performed throughout the day. The festival was held as an annual event for six years. 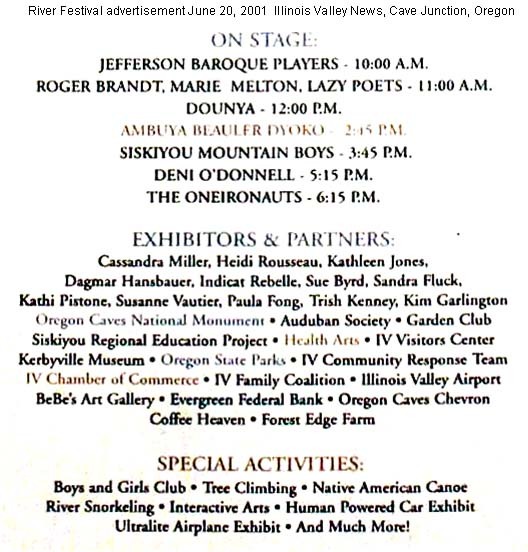 River Festival advertisement showing partners, activities, and scheduled performers. June 20, 2001, Illinois Valley News, Cave Junction, Oregon. In 2005, a new highway bridge was built across the river by the Oregon Department of Transportation. This included installation of a raised sidewalk across the bridge and extension of the sidewalk to Cave Junction. A wheelchair accessible ramp was developed from the south end of the bridge to the entrance road into the park. Unfortunately, the waterline that brought water from the city to the park was removed when the new bridge was constructed and a new water conduit was not placed under the bridge so the water line to the park could be restored. The park’s only plumbed restroom was closed and water fountain was decommissioned as a result. In 2009, an equestrian parking area and trailhead was constructed on the westside of the park in partnership with a local chapter of the Backcountry Horseman Association. This new recreation area has a vault toilet, gravel parking lot, and eight miles of equestrian and hiking trails. In 2012, it was estimated that the park averages an annual visitation of approximately 125,000. Visitors to the park include residents from the local community as well as residents of Grants Pass, Medford, Crescent City and out-of-state travelers and international travelers passing through on Highway 199 and stopped because of highway signage identifying the site as a state park. An Adopt-a-Park agreement was signed with a local nonprofit, the Illinois Valley Community Development Organization in 2013. * Cave City Park: In the early history of auto travel, entrepreneurs developed camps where travelers could spend the evening. These were called auto camps or auto parks. Sometimes, the name “auto” was left out and the business was called a “park” or “camp”. Cave City Park was not a “city park”. It was an auto park or campground for travelers. 1) Illinois Valley News, July 24, 1941. Baumberger builds dam across river at Cave City Park. 2) Illinois Valley News, May 20, 1955. Wes Peters named recreational youth director. 3) Illinois Valley News, June 2, 1955. Recreation director announces two-month summer sports program. 4) Illinois Valley News, June 23, 1955. Over sixty youngsters sign up for valley summer recreation program. 5) Illinois Valley News, July 7, 1955. Junior life saving classes will begin at Forks Saturday, July 16th. 6) Illinois Valley News, July 14, 1955. Recreation head gives summary of summer activity. 7) Illinois Valley News, July 21, 1955. Life saving class short on pupils. 8) Illinois Valley News, December 29, 1955. Illinois River bridge during flood. 9) Illinois Valley News, March 22, 1956. New Illinois River bridge collapses last Friday evening; three hurt. 10) Illinois Valley News, February 7, 1957. New approach to East Fork Bridge. 11) Illinois Valley News, June 13, 1957. Will do grading on road to Forks swimming hole; Summer recreation starts Monday – evening program made up; Parking area near forks is enlarged. 12) Illinois Valley News, June 20, 1957. Rock crusher in operation. 13) Illinois Valley News, August 13, 1959. City must vacate dump; “Forks” land to be used for recreation. 14) Illinois Valley News, August 27, 1959. Dump site and ditch cleaning occupy council. 15) Illinois Valley News, August 25, 1960. Sixty-acre “forks” tract approved as state park. 16) Illinois Valley News, January 25, 1962. Park clearing underway at Illinois Forks. 17) Illinois Valley News, April 26, 1962. Illinois River “Forks” park leased to state by government bureau. 18) Illinois Valley News, June 28, 1962. Recreation swimming lessons go to Forks and Lake Selmac. 19) Illinois Valley News, August 23, 1962. New map out shows “Forks”, Collier bore. 20) Illinois Valley News, July 8, 1965. Photo of Forks Park. 21) Illinois Valley News, July 29, 1965. IV Chamber of Commerce offers $100 reward for “Forks” vandals. 22) Illinois Valley News, August 12, 1965. New toilets installed at the Forks after vandalism. 23) Illinois Valley News, February 23, 1967. IV Grange backs Chamber on Forks Park & Happy Camp Road. 24) Illinois Valley News, July 6, 1967. Swim lessons begin Monday July 10. 25) Illinois Valley News, May 3, 1995. Fishwatch students work on Forks handicapped trail. 26) Illinois Valley News, June 17, 1998. River Celebration a big splash of the first water. 31) Owen, Marchetta, 2009. Illinois Valley Recollections. Self published. 33) Illinois Valley News, August 14, 1958. 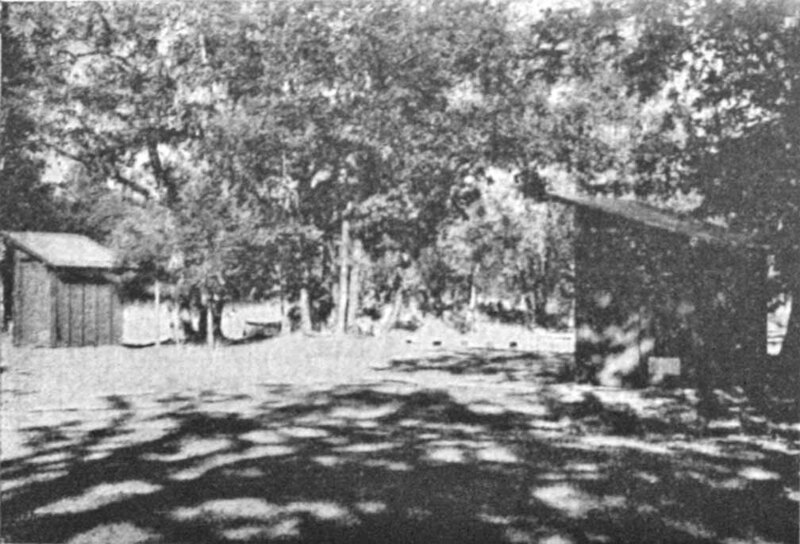 Elwood Hussey built first cabin on homestead; area then thickly forested; highway spurs growth (a history of Cave Junction).